Support a Youth…Buy a Goat. I look at the young people around me, moving with purpose, not a hand-held electronic devise in sight. They wear matching green ties that identify them as members of various 4H chapters. They are here at the Contra Costa County Junior Livestock Auction to show off months of diligent care raising their market animals and hoping for a buyer. I am here to check out a particular goat. “Being in the 4H is how I learned to run my own business” I am told by the mother of a young boy who exhibiting his pig in the auction ring. “I learned what it takes to do a job well, be poised and talk to people, how to manage my losses when my animal didn’t sell and reinvest my gains when they did.” She is a successful realtor now. My sister recently gave me a book called The Year of the Goat (by Margaret Hathaway). It chronicles the cross country back-to-nature soul search of a young Manhattan couple. They talk non-stop about Boer goats, a hefty breed developed in South Africa as meat goats. They hang around with goat breeders, visit auctions and point out that about every ethnic group on the globe appreciates goat meat except Northern Europeans and North Americans. They claim it is the most consumed red meat worldwide. I realize this might be true. I arrive at the fair grounds an hour before the livestock auction begins. There are separate enclosures for the 70 pigs, 14 steers, 35 sheep and 13 goats. I locate the goat area and meet 11-year old Thomas Major of the LaMorinda 4H chapter, the young fellow who raised the goat I have come to see. Thomas points out the ribbons hanging above his goat, tells me he has not lost a competition and his goat won the title of Supreme Market Goat for this show. He glows with pride. I ask if he wants to raise another goat. “Yes… but I have to sell this one first and not loose money.” I talk to Lynda, Thomas’ Mom about how much they need to make at the auction. She has an older son exhibiting 2 animals ahead of Thomas, and this could be a real win or lose day for the family. Kelsey Fallon, from the Knightsen 4H chapter, has a nine month old male goat up for auction. Her mother tells me he is cranky and often butts Kelsey, knocking her down and everyone in the family will be happy to see him go. Jaqub Ramirez shows off a large male crossbreed of 93% Boer goat for good muscle development and 7% of another breed that yields a long loin. At 92 pounds this goat is a little fat, he admits, but he is keen to perfect his technique and as with all the 4H kids I talk to, says he wants to raise another. The 4H was founded in 1902 with a goal of helping youth develop citizenship, leadership and responsibility. 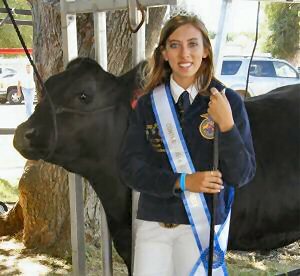 Though thought of as focused on agriculture, today’s 4H emphasizes personal growth and life skills. They offer programs in science, engineering, technology and operate in 80 countries world wide. 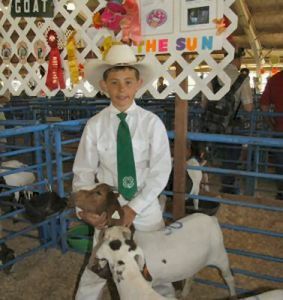 I discovered the 4H auction and Thomas’ champion goat through an email to Full Boer Ranch, outside Martinez. Jan Griffin and her family run their ranch as a boarding facility for elderly horses and recently took to breeding Boer goats to help make the ranch more productive. “The goats are in line with what’s important to me, different to sheep and cows. They need less care and they have personality”. Thomas bought his young goat from Jan’s farm. “The 4H kids are worth supporting and you would be helping keep small farmers in business. Also, anything over market price is a charitable donation” says Jan and once at the auction I realize that could be substantial. Most of the buyers are from within the community. A representative from the local Les Schwab Tires outlet wins multiple bids and spends thousands. Families bid on each others’ animals. One mom told me no one bid on her daughter’s animal so she bought it herself and will donate the meat to the local food bank. She will get the tax write-off and her daughter will be able to raise another 4H animal. Thomas positions his goat in a show stance and the auctioneer starts his rapid-fire pratter “what do I have, where’s my first bid for this champion meat goat…” Unlike for the pigs, steers and sheep there are few bidders on the goats. This is still and “alternative” meat for many folks. Thomas looks up from the auction floor with a bright, hopeful smile and I raise my numbered buyer’s card. How to choose a goat: Jan tells me to look for an animal about 75-80 lbs. and not over one year old so the muscle is developed yet it won’t be tough. You don’t want there to be fat, which builds from the inside out… no wiggly belly. Feel the forearms and back, which reflect what the loin will be like. Look for width in the chest floor, important to show the goat’s development. Males will be more muscular. For a benchmark, look at those that have won competitions as the judges are looking for the best conformity to the breed standard (and at how the 4H kids show their animals). How to bid: This is a family day, so relax and talk to folks, admire the animals and expect to spend 3-4 hours. That is, until you want to bid. You have to be sitting in the stands with your buyer’s number card ready and a definite plan as it moves fast. Determine your top bid ahead of time. Be aware that some folks purposely over bid on animals as a contribution to the 4H youth, so have several possible goats in mind. Bids are for live weight and by the pound, rising by increments of $.25. A goat will yield about 40% of its live weight. The goats at this show averaged $4.50 a pound. You also will pay a fee for “harvesting and transportation” (this was a very reasonable $35 show price) and a butcher to cut and wrap (three were offered ranging from $65 to $85 for the job). From auction day to pick up day: No special requests, you have to just go with the program. I called the “harvesting” plant to request the offal be sent and was told that service was not available with the show price. How about if I drive to the Dixon plant and pick up the goat whole? Sorry, it is in a large “lot” and it can’t be separated out. When will it be sent to the butcher? Can’t really tell, the paperwork has to come in from the fair, the scheduler has to…etc. The butcher wanted to hang the meat for a week in his locker to tenderize and develop flavor. When I called about scheduling a pick up he gave me a narrow few hour window…or it gets frozen because he is closed the next 2 days. From the auction to pick-up you will have about 2 weeks to clear out your freezer. Recipes: Goat meat is very lean and it is wise to check out how to cook it (see the Tips and links below). Although many of the cook books in my collection are ethnic I found only 2 goat recipes. I had better luck tracing bloggers who specialize in ethnic foods. Their recipes were interesting, proven and many have photos. I now have a collection of goat meat recipes from Sri Lanka, Thailand, Vietnam, Spain, Morocco, Pakistan, the Middle East, Italy and Mexico from food blogs. as usual great article……as a former 4H ‘er ( I did sheep ) brought back memories. nice to know it still is arround.